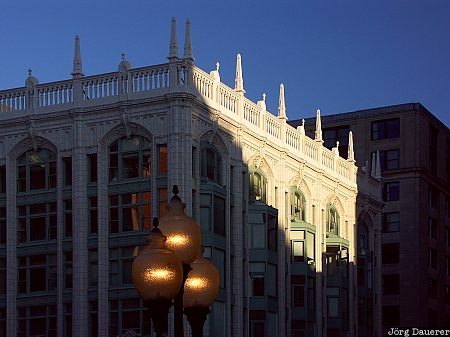 Soft evening light illuminates parts of a building on Newbury Street in the Back Bay area of Boston with a street lamp in the foreground. Boston is in the east of Massachusetts on the east coast of the United States. This photo was taken on a sunny day in August 2004. This photo is part of the exhibition Street Lamps (July 2008). This photo was taken with a digital camera.